"We Don't Need No Music"
Straight Company is like a musical magnet, drawing together diverse styles and transforming them into something uniquely there own. Although they have experimented with different musical styles and formats over the years, they remain true to their a cappella roots and continue to deliver vibrant, airtight harmonies reminiscent of nothing you have heard before. Straight Company began over twenty-five years ago as a concept to blend the sounds of the founders’ African heritage with the sounds of the world at large to create a new and exciting style. The group has performed all over America and in many foreign countries and for an impressive list of dignitaries and events. Events such as Hosanna, The ELCA National Convention, Jubilee, Evangelism Connections, several of the Six Flags theme parks, Winter Fest, The Crystal Cathedral, Vice President Gore, and many other dignitaries. 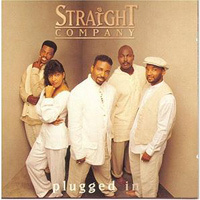 Straight Company’s CD "So Excited" charted in many markets around the USA and their latest, "Courtesy of God" won Album of the year at the CAMAs (Contemporary A cappella Music Awards) for 2002. Contemporary Christian group Straight Company is five deeply spiritual young men, sadly less by one, Micah Bennett, whose untimely passing in February came after completing the recording. The beautiful liner notes contain many tributes to this special man. But what a recording it is-15 powerful, all original songs, complex, compelling rhythms and harmonies, perfectly blended voices, yet each one strong and filled with feeling in its own right. "Courtesy of God" is a fresh breeze, innovative, brash and thought-provoking, like this lyric from "Ain't Go'n": "Cuz everybody talk'n about go'n up to heaven ain't go'n, Some people think they're gonna slide on in, liv'n any kind of way, You better think again." "Choose," "Promise," "High Priest," the title tune, "For You," "Smile," "Somebody Told Me," "More Than You'll Ever Know," "Satan," "Unto His Own"...each song is an a cappella gem. Guest artists include Jeff (Prime Minister) Murrah and Tavairy (Tavus-D) Williams. One of the strongest Contemporary Christian CDs we've ever enjoyed. Highly recommended! The latest release from this talented vocal group. Do not doubt that the musical ministry of Straight Company is just that. It is so easy to get lost in the melodies of pop songs and R&B which are the language of their ministry that one might miss the serious message. It's joyful musical package. But then again maybe it's good to just find yourself picked up and carried along by this phenomenal septet, for their message is all the more potent when it gets through. The recording is largely original tunes, mostly co-written by multiple members of the group. Jesse Murrah, who goes by the name Essej, is the elder of a trio of siblings in the group and the senior spokesman. He explains that a major motivation of the group is to break down racial barriers and prejudice with love. We have to say that they are definitely helping to harmonize the world!